been damaged or improperly mastered. you want it), along with this MacTheRipper Manual if you need it. Region’ to “OFF” when it says that RCE is ‘-CLEAR-’. regardless of the numbers that show up in the ‘Region’ field. Disc RPC displays which regions the DVD is set to work in. setting for the disc region(s) you wish to have your backed up DVD able to play in. 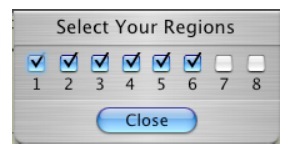 button, and select the regions you want the output to work with, and hit ‘Close’. In the above example, the DVD would play in regions 1-6, but not in 7 or 8.
wavy lines. This is enabled by default. DVD±R, as it can break the menu system on certain DVDs. features, leave ‘Enable Advanced Features’ unchecked. 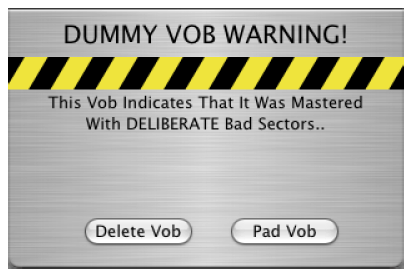 WARNING: The options you check here will be DISABLED during the DVD playback. this mode (or rather their UOPs will be disabled). back to the main window. Now it’s time to choose the type of extraction you want in the ‘Mode’ tab. or DVDRemaster). For this, you will choose the ‘Full Disc Extraction’ option. feature title set by itself. one if you don’t want the Main Feature title set. indicated with the letters ‘(MF)’. You can also set the desired angle if there are several. 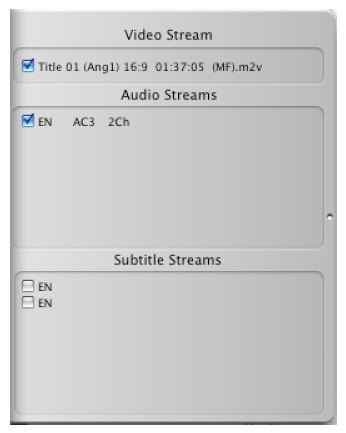 Here, you can choose exactly which streams you want extracted. range you wish to extract by choosing the start chapter ‘SChpt’ and end chapter ‘EChpt’. .pcm, .spc), follow the demuxing instructions above for Title Only mode. you didn’t get the parts you wanted. remain checked, as it is by default. wait for the disc to be scanned, you can set this option to ‘Disabled’. hard drive. Otherwise, it should be left on its default of unchecked. crashing problems upon DVD insertion. wish to copy the rest manually. the movie starts), so it’s recommended to use Disc Copy mode or DVD2OneX instead. DVD2OneX or Popcorn, and choose 'Pad' if you are doing a Full Disc. This is a message board forum with lots of information on all aspects of Mac video tools. if you can’t find the info you need. backup DVDs onto DVD±R media. us at mtr@ripdifferent.com and we will try to get it resolved. modes, along with the ability to choose which streams will get extracted.